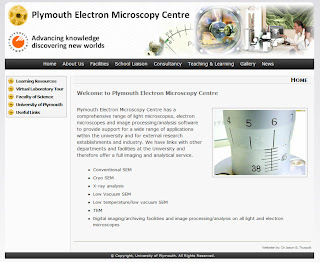 Plymouth Electron Microscopy Centre website goes live! Very please to have upload and made live, the Plymouth Electron Microscopy Centre's new website that I have been working on recently. This site includes Quick Time 360 Virtual Reality, integrated MobileMe gallery and a customised Blogger Blog. Where can I find my Learning and Teaching sites? How do I migrate content from existing 2008 Learning and Teaching sites?